Purpose: To compile all information about how to play Super Smash Bros Melee. @Grim_reaper1355 check out the melee library Google doc it has mad info! Endorsed by Top 6 "God", PPMD. Welcome to The Melee Library, the most valuable collection of Melee information and the best place for a player to learn. For questions or suggestions related to content, contact Sycorax on Smashboards or by email. For everything related to the code/website, contact Nate. KJH's in-depth guide on 20XX 4.07(++). At the time of writing this, it's the latest version of 20XX. Ginger's Top 5 20XX practice tips. Ginger goes over five important tips. 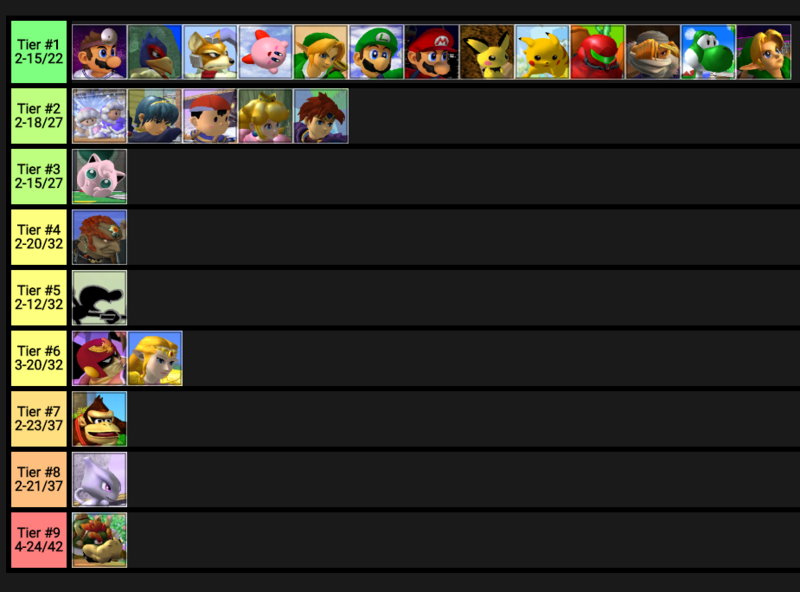 Some of those are specific to Falco/Fox but the video will still be interesting to other characters nonetheless. This Falco practice routine will ensure your techskill is crisp and efficient. A playlist regarding the macro aspect of Melee. Topics include cross-ups, stage positioning and more. A playlist regarding the micro aspect of Melee. Topics include crouch-cancelling get up attacks, every Puff rest setup, and more. UnclePunch's training mode. This is a wonderful addition to 20XX which will help you train specific things like ledgedashes and l-cancels. Similar to Armada's 2015 Peach Edgeguards video. Put on some music and study up. A strong option that Peach can use on shield. Especially useful against Ice Climbers. Wisp explains how Peach's fair fits into her general gameplan. Wisp discusses Peach's 50/50s and how to win mixups. While being Peach-centric, the video is useful to any character since the topic at hand is universal. Quetz recently discovered a new method of floating called “subfloat”. This video describes how to do it and why it can be useful to implement it in your game. This library includes a lot of information, but you may find that, sometimes, you need to search for an answer. This is especially true for character discussion threads. I will explain some basic search methods to help you find answers. For this Library page, you can use Ctrl+F on your keyboard to search for character strings to find things more quickly than scrolling. For example, to find info about powershielding, you might press ctrl+F then type "powershield" or try "power shield". This is probably the most important search function to understand since Smashboards can be hard to navigate but contains a vast wealth of information. In the top right corner of each Smashboards page there is a search box. Click on it and a number of options will appear in a drop-down menu. The most important ones, in my opinion are “Posted by Member,” “search this thread only,” and “search this forum only.” Those will help you focus your search. Some of these options only appear on specific pages. There is actually some decent information and discussion on /r/SSBM especially for newer players. You might be able to find useful stuff on /r/smashbros, too. NanchoMan wrote a wonderful bit about using the Reddit search bar. Their wiki page is full informative themed threads. Google knows all. If you are having trouble finding stuff on Smashboards or Reddit, you might have some luck with Google. Google’s search engine is a bit stronger than those others'. If not stronger, Google is different and may prioritize different results allowing you to find what you want. When searching with Google, use the ‘site:’ function to get results from specific websites. Typing “site:[website]” will only return results from that URL. Use “site:smashboards.com” or “site:reddit.com/r/ssbm” to refine your search. There are lots of other tips and tricks for searching using google. Here is a good infographic about it by HackCollege. The SSBWiki has a lot of hidden gold. There is good information on there, and there is wrong or outdated information too. A lot of articles are incomplete. Still, it is worth checking out because it may have some stuff that is “too simple” to be discussed in guides and write-ups. Information for beginners. Start here if you are just learning the game. They discuss what hardware you need to start playing, how to get acquainted with your local scene, and how to get started on learning the game. A list of common jargon used by smashers. The post is pretty old. NMW explains a stratified way to progress in Melee. Those strata are techskill, punish game, DI, neutral game, and innovation. It provides a general roadmap you can use to look forward on your journey to goddom. SleepyK tells beginners what they need to learn first. His guide emphasizes tech skill, but provides other good teachings, too. Teaches basic advanced techniques everyone needs to know. THE source for having a mindset to improve and how to achieve it. Alex criticizes Drastic Improvement's teaching methods and provides an alternative. A playlist of videos covering basic techniques. It is a little redundant compared to the previous sources, but maybe you prefer videos. List of some basic tech that every beginner should learn how to do, plus some tips for practicing. Most info is redundant with previous beginner sources. This video covers the process of finding a main in a fighting game in general. In short, make sure that the character you choose fits your playstyle and don't base everything around perceived strength. Kira explains the procedure for choosing character, ports, and stages in tournament. Armada, the best player in the world at the time of posting this, gives the following advice to new players: stick to one character, be open-minded, work on movement, analyze your own matches, and play to learn not to win. Lucien and HomeMadeWaffles discuss spacing, a fundamental aspect of Melee. Options for following up after someone hits the ground from a tumble. Zero discusses covering options and following up on platforms. Zero explains how to dash dance like Mango. KirbyKaze explains in a very visual manner how to SDI Fox's Up-throw Up-air. Similar to KirbyKaze's guide but with more technical information. A simple video about the essentials of directional influence. Some of the info in this video is slightly wrong for the sake of simplicity and brevity. 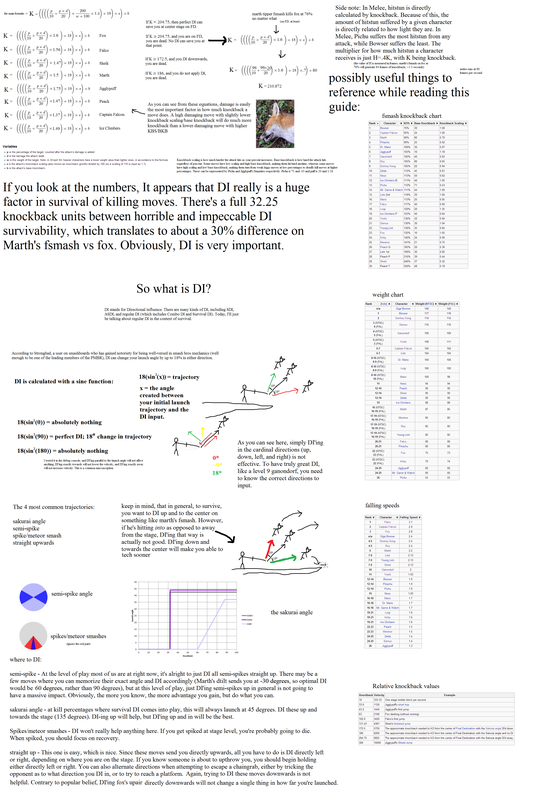 For a more complete explanation of DI, read this post: The Specifics of Trajectory DI. A video about the debug menu, which can be accessed in the 20XX Hack Pack. It is a useful way to view hitboxes and test options and situations frame perfectly. A list of controls available to you in develop mode. Pairs nicely with Gravy’s video above. Use ASDI down to collide with the ground when hit and avoid followups. Shielddropping opens a world of options when shielding on platforms. Another video that explains the basics of shield dropping. Wall tech to recover better and be in sweet combo videos. Phanna explains various ways to drop through platforms including normal platform drop, Isai drop, shield drop, no-impact drop, waveland drop, and PC jump drop. There are better resources on shield dropping elsewhere in this library. Additionally, there is a mistake describing the Isai drop. One does not dash upon landing, but rather, walks. Another way to drop through platforms. Dshi discusses what he calls the "proactive" neutral game. 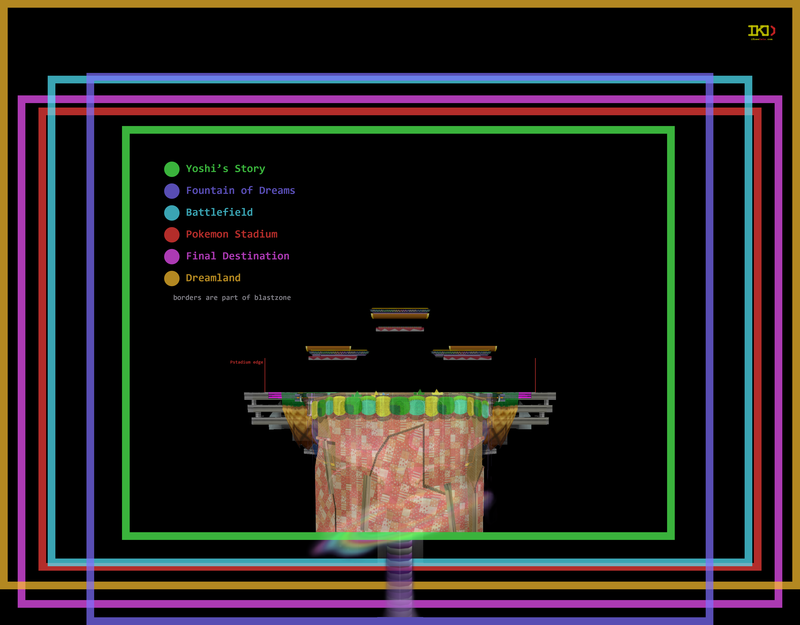 A picture that shows how the blastzones are layed out on all the legal stages. Remix explains with technical illustrations how to ledge tech and what options you have afterward. Kira discusses how changing the rhythm and timing of your attacks can make for effective mixups. Undershooting and overshooting aerials are a very important part of the neutral game. Raiku explains how to do them and what they're useful for. Mixups in the number of times a player repeats an action before changing to something else. A video analyzing how fastfall timings impact the neutral game and how they can throw your opponent off. DI mixups are effective tools in the punish game that will let you extend your combos or get kills early. Captain Faceroll gives advice on how to improve quickly: stick to one character, attend a lot of tournaments, practice punish game, learn how to lose, and play to learn. They discuss how to use undershot attacks to bait the opponent into a bad commitment. Edge-cancelling will allow you to do flashy and unpredictable follow-ups. CDK goes over how to perform edge-cancelled attacks and what they're useful for. CDK discusses, on a basic level, the types of shield, shield DI, shieldstun, buffering options out of shield with the C-stick, shield poking, and options out of shield in general. Albert got pretty good pretty quickly and he wrote about how he practiced. PPMD explains effective methods to practice by oneself even without the 20XX Hack Pack. People ask questions along the lines of “How Do I Practice Wavedashing?” and I wanted to write a succinct answer. Another guide about practicing effectively. Zhu and Cactuar discuss effective training routines. They also talk about reaction speeds and what you should do to improve it. Achilles’s revolutionary hack pack makes practicing a breeze. Ginger’s Top 5 20XX practice tips. Achilles shows how to use the frame counter function in his hack pack to count the number of frames your character is in an animation. Achilles explains how to use the hitbox freeze repeater function in his hack pack to practice ledge teching. It has numerous other uses as well. In this playlist, Achilles will walk you through the process of using save states in 20XX 4.06. Schnerp made a post on Reddit to explain 20XX 4.06 save states. It's more succint than the longer videos that Achilles made himself. These two videos show what you can do with the 20XX hackpack version 3.02 to improve your training routine. An infographic that shows basic 3.0 commands. An infographic that shows basic 4.0 commands. The 20XX Hack Pack opens a world of training possibilities, and Clowsui helps you understand how to navigate that world. Doing well in Melee is founded on good movement. These drills will have you practice necessary techniques you may not have thought of before. This shows which moves and movement options can be performed from other options. This is useful for undering the tree of optins available to you in various situations. How Do I Improve Against Players Who Are Worse Than Me? Your practice partners being worse than you is not an excuse for not getting better or improving slowly. Create a timeline of button inputs with a sound playing for each one. It is sort of like practicing with a metronome but better. One of the multiple ways of practising perfect ledgedashes on 20XX. This guide explains how to run 20XX or other modded game files on your Wii. Additionally, it directs to guides for BootMii and Priiloader which allow you to load your games without a wiimote. This video is a rant, but is all very informative. SleepyK is mostly targeting people who say they want to be good but do not follow through with it. He also talks about situational analysis starting at 9:53, which is VERY USEFUL and a constructive way to view the game. NanchoMan uses the 5 Whys and why-because analysis to explain an approach for solving problems. A post by PPMD in the Falco thread discussing how to solve specific problems in your games. Season 1: Tafokints teaches Sheik to Atrioc. Season 2: Tafokints teaches Marth to Van. An article about Kira, a Sheik main from SoCal. The value in this article is the section about changing habits. Breaking habits can be hard and many people try to do it wrong. This article explains it scientifically and gives advice. Little England talks about his journey to becoming a good player. He explains various aspects of the game as well as tech. Forgetting about winning friendlies in order to learn something new, practice a new technique, or experiment with a new tactic. Santiago calls out some of the reasons you don't git gud. A guide to navigating the debug menu. Tafo discuss confirmation bias and how bad feedback loops can hinder your improvement as a player. While written for Magic: The Gathering players, the cognitive biases discussed in this article can easily be applied to problem solving in Melee. Briceño provides a way of structuring learning to improve performance and learning. Kira explains how to analyze matches. In this particular example, he focuses on out of shield options. Two people who have struggled with mental barriers discuss how they overcame those barriers. PPMD improved in a region where there were not many people around and not many good people. Here PPMD discusses how he found motivation to improve and how he learned the game. SleepyK provides advice on nerves in tournament, written in a hilarious tone. Courage and confidence will help you make and take opportunities. Modulate between emotional states to better achieve goals in specific situations. Emotions are a warning sign of something being off-kilter. Learn to deal with this through focused self-awareness allowing you to find the source of that emotion. Then you can work on treating the cause. This is a book written to address the mental side of performance in sports, specifically tennis. A strange suggestion, but its praises are sung far and wide by smashers who have read it. The player of the inner game comes to value the art of relaxed concentration above all other skills; he discovers a true basis for self-confidence; and he learns that the secret to winning any game lies in not trying too hard. He aims at the kind of spontaneous performance which occurs only when the mind is calm and seems at one with the body, which finds its own surprising ways to surpass its own limits again and again. Moreover, while overcoming the common hangups of competition, the player of the inner game uncovers a will to win which unlocks all his energy and which is never discouraged by losing. A synopsis of the “be present” mindset, which no one has ever had anything bad to say about. Wobble’s blog about psychological and theory aspects of competition, Melee, and life. SleepyK discusses how to approach increasing your understanding of the game, consistency, and maintaining your peak in a constructive way. Lade discusses accepting what you cannot control, having the wherewithal to recognize when and where things go wrong, believing in yourself, taking responsibility for your failures, giving your opponent credit for their successes, not over-adapting, and knowing that everyone bleeds. MeTrik talks with Zhu and Cactuar about how to manage motivation and have healthy mental habits. A systematic approach to mindfulness and changing cognitive distortions. Snips discusses the interactive aspects of Melee, mixups, baits, and pressure. An analysis of the causes of tilting and its prevention. An analysis of gameplay in neutral based on Rock, Paper, Scissors. Wobbles explains his theory about four fundamental pillars of Melee: technical skill, mindgames, tactics, and spacing. Zhu and Cactuar explain how movement can be used to influence what your opponent is going to do. A blog about smash by a really smart player. He posts from time to time. What do Zoning, Conditioning, Threatening, Counter-Poking, Camping, and Positioning all have in common? Druggedfox explains how frame advantage can be used to reinterpret neutral in terms of frame advantage, and how it can help you understand certain winning neutral interactions better. This post covers two very different topics, but both are useful. The first topic is about how different characters utilize different traits and styles better than others. Because of this, one can learn different things from playing and analyzing different characters (e.g. Advance, Attack, Avoid). The second is about approaching and what it means, a more complicated idea than one might first believe it to be. PPMD discusses approaching more and how to do it effectively. He also talks about why Fox is a good character. NanchoMan applies game theory to Melee. He also discusses analyzing one’s own play. Juicebox explains footsies in Street Fighter, but it still applies to Melee and the neutral game. An opponent is staggered if they have reduced options or are feeling nervous. This is a guide about exploiting that. Omni explains what it means to have a positional advantage and how different players will react based on their positions. Cunning Kitsune talks about creating, building, and sustaining control of a match and dictating the flow of the game. In this smashboards post, Emblem Lord discussing how mixups and cross-ups add layers of depth to the game. Lunin emphasizes prediction, case constructions, spontaneity, dynamic reactions, patience, unpredictability/conditioning, and emotional control as seven habits of professional smashers. Wobbles’s blog about psychological and theory aspects of competition, Melee, and life. An insightful article about navigating the space of suboptimal strategy to counter the particular suboptimal strategy of an opponent. David Sirlin explains it a bit better (or at least in more depth) here. While personal opinions of Mr. Sirlin vary, his ideas are sound. This series on Playing to Win gives powerful insight on the mind of a winner and explains complicated aspects of how games work fundamentally. The section about Yomi is a must-read. Sūnzĭ’s Art of War, “for the last two thousand years it remained the most important military treatise in Asia” Interesting read on tactics and competition. PPMD discusses L-cancelling, balance, and crouch cancelling as some of the reasons Melee may not be the best game. He compiled a list of a bunch of resources in the fighting game community. Most of this in applicable to Melee as well. A well timed input can cover two options instead of one, for instance rolling to beat double shine and shine grab. Overswarm discusses the history and reasoning behind standard tournament rules. Overswarm explains how stage striking works and why we use it. LordKnight explains how you can make assumptions based on the character your opponent is playing. A comic explaining and illustrating the concept of dead space. This topic is covered more in depth in the first episode of season two of Zero to Hero by Tafokints. They explain the importance of adaptation on account of the fact that there is rarely ever a 100% correct option in Melee. A comment by Apotheosis276 in a r/ssbm discussion thread about this video provides additional insight into Wobbles's lessons. He explains the importance of reaction time in neutral. Scar wrote several blog posts applying the thinking of Eric Ries's lean startup business model to Melee. A (somewhat) long write-up by A_Reverie that discusses the neutral game. 4 Types of Attacks (and Styles!) in Super Smash Bros.
SSBM Tutorials discusses direct attacks, counter attacks, positional attacks, and baits. What Clowsui views as fundamentals. "The text is based heavily on principles I read/discovered in the Tao of Jeet Kune Do and The Book of Five Rings." NMW analyzes how Lord uses multiple gimmicks to get an edge on his opponents and just how important understanding situations is. In the context of Brawl, Mew2king explains how to cover options and break down situations. (Copy pasted text from a dead webpage.) In the context of Brawl, Mew2King emphasizes building your strengths to gain advantages. NMW uses Lord's example again to show how apparently horrible options can actually work well if used intelligently during mixups. Mew2King explains how conditioning can force 50/50s and help you win the neutral. Skyline talks about a problem solving method popular in the US military called the OODA loop. This has application in Melee as well. A VLOG where Armada discusses the power of believing in yourself and putting in the necessary amount of work to get good among other things. A very basic introduction to teams. KirbyKaze discusses positioning in teams, building off of Umbreon's article. NMW covers teams positioning, top-tiers' strengths and weaknesses, popular teams compositions, common strategies, and common mistakes. A specific team double attack that Sauc3 calls the Spanish Weave. SleepyK lays out a few team strategies that work effectively. In UmbreonMow's Drastic Improvement guide, he has a section on teams. He discusses utilizing a 2 vs 1 vs 1 strategy and categorizing opponents as conservative or aggressive to help define your in game choices. A VERY advanced guide to teams. NMW steps through some basic reasons for picking certain stages, especially in doubles. In short, don't blame your teammate for messing up something simple once. In this guide I will go down into the specifics of your options as a TO, and help to provide you a framework for running a successful tournament. How Do I Manage Time for a Round Robin Pool? How Do I Manage Time for a Double-elimination Bracket? How Do I Create an Effective Results Thread? Random, not character specific tech skill. Mahie is slightly wrong. It only works for Marth, Roy, and Samus because their shields are programmed weird. It kinda works for characters with low crouches like Sheik, Jigglypuff, and Kirby but not to the same level of effect. Some people hold their controller differently to make things easier. This is a discussion about the advantages and disadvantages of different styles. It is in the context of Peach, but the information is easily generalized to other characters. Here are two videos showing claw grip. 1, 2. Pay attention to both the left and right hands. Gravy breaks down the different ways you can pivot. You can set up your character to jump in the wrong direction. Explanation in the video description. Grab ledge quickly with most characters on Fountain of Dreams. A weird little tech that some characters can do. Kira explains what buffering Dthrow is and how it can be useful to tighten up your grab game. Use shield ASDI and knockback to slide off platforms in shield and quickly retaliate. Reduce your knockback velocity by 5% by pressing L/R right before you are hit. Walk or crouch before smashturning to help reduce the chance of messing up a smashturn. Gravy explains three option selects related to l-canceling, fastfalling, and options after landing. Only a light trigger press is required to l-cancel and it doesn't lock you out of tech. Shield drop while on a platform that is close to the ground, e.g. on Pokemon Stadium or Fountain of Dreams, to quickly land and do grounded moves out shield. Armada shows how you can use platforms push-off to start or extend a combo. Buffer a spot dodge after a DSDI Tech to allow your character to stay on the stage longer. Other sources and things to know about Melee that do not fit into the other sections. Similar to NMW’s list of noob habits. SSBM Tutorials made a video detailing 5 noob habits. This video gives helpful tips to stop making these mistakes. Video series of match analysis with top players. Great for learning how to do match analysis yourself. A series of podcasts that are interviews with top players. Each player has three podcasts that cover questions from the community, match review by the player, and advice about the player’s main. A collection of the names of a bunch of combo videos for all characters. These are all pretty old so many probably cannot be found anymore. Watch and learn combo trees. A searchable database of match videos. You can filter by character, player, stage, event, caster, and match type. Useful for match analysis. Hugs analyzes his match versus Leffen at Press Start. He talks a lot about mixups and conditioning. Most events use this rule set. Use it to check the legality of whatever. 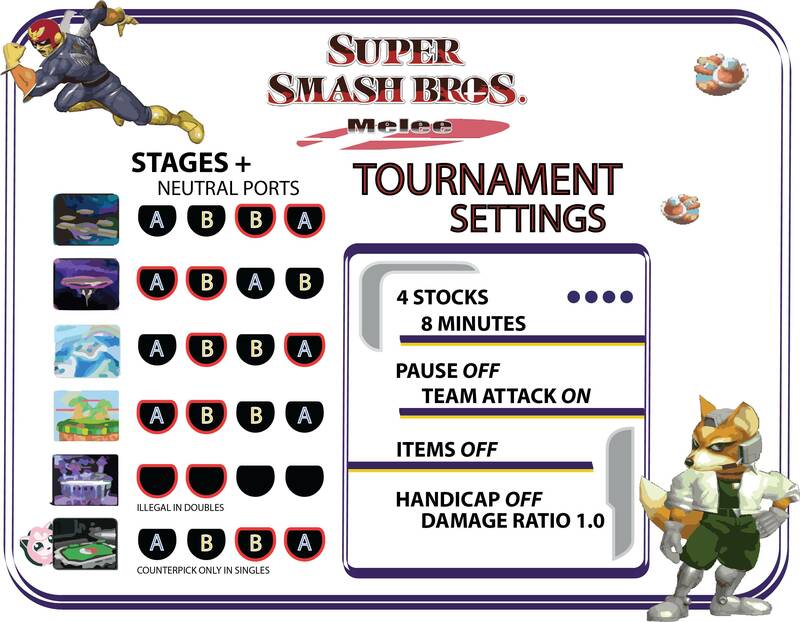 A handy picture to reference for standard tournament settings and neutral spawn points in singles and doubles. A four part routine for healthy gaming: mobility, forearm stretches, and a posture check. David Collins gives a few tips to prepare for your next tournament. Playlists of videos where Mango analyzes his own and others’ sets. TauKhan explains how to get a reverse hit from a move, e.g. grab ledge then reverse knee edgeguard with Captain Falcon. A pretty self explanatory gif of the specific times of Randall the Cloud’s movement. Here is an explanatory post that accompanied the gif. This is a playlist of interviews conducted on Tafokints’s 12 hour stream geared towards improvement. He interviews several community members asking about how they got gud, their roads to prominence, and advice. HugS highlights having a routine and focusing on performance over results as important strategies to play consistently. I want to share some tips both for how to play your best in tournament and how to get the most out of attending a tournament. First recording of weird shield mechanics before the Invisible Ceiling Glitch was fully understood. A collection of threads with gifs and explanations of unique and vital tech for all characters. A Jigglypuff-centric guide on punishing roll-ins. Ask Me Anything threads mostly contain crap irrelevant to improving, but there can be nuggets of information in them. This link will take you to a list of AMAs done on r/smashbros. Scroll down to see melee. Arc and HugS have done AMAs on r/ssbm. JazzDynamite asked top players “Given a hypothetical player of top 5-6 skill, which characters could they use to win a tournament like The Big House 5? Assuming they put all of their time/effort into that character? They used an eye tracker to figure out where people look when they play Street Fighter. Players often ask, “Where should I be looking?” and this gives you an eye-dea of what experienced players do. The tracker follows the player playing Elena. Notice that the eye focuses in the center during neutral gameplay, and focuses on Ken when waiting for reactions. Info about playing Melee on a setup besides a console+CRT. More info. Useful for learning how to recognize different tech options in order to react quickly. You can tech twice with one digital L/R input. Remix shows how to use 20XX to practise reaction tech chases (with Falcon). A website that shows gifs for various techniques. It also has a page for locating local Facebook groups. Tafokints discusses the advantages and disadvantages of maining two characters. Contains detailed information on alternative setups to a standard CRT. Some CRT TVs do lag. Melee on console: How much input lag is there? And does it always stay the same? Stabby uses a high speed camera to empirically determine input lag on console and discovers a frustrating result from crappy polling. Players with fewer stocks can escape grabs more easily. Similar info by Magus. Links to various Discord channels of Smash related things. Cause and solutions for springy controllers. A video discussing V-cancelling which allows you to lower the knockback of an attack under certain circumstances. xChaos takes a unique look at neutral interaction and positioning by mapping out where neutral wins and losses occur on various stages in various matchups. A fantastic tool for providing feedback on game replays. Draw and write notes on videos and share for an improved learning experience. Remix looks at things the players in Genesis 4 top 8 could do better. Kira explains what refreshing recovery moves (such as Luigi's down-B) is and why you would want to do it. How to determine the number of actionable frames you have while your opponent is in shield stun. This helps you manage multiple game files in an emulator. If you don't press the shield button quickly enough, you will fail to block attacks because of a weird programming quirk. A complete list of all shield sizes in the game (including the Hands and Gigabowser). Wavedashing out of shield using the same trigger can result in slower, suboptimal performance. Armada advises players to overshoot or undershoot their moves, crouch cancel, have multiple mixups, use different moves based on the opponent's percent, and stuff aggressive opponent's moves with your own. A blog by Norcal Fox player, L. At the time of writing this, he has only written about effective practice, mental game, and working memory. A playlist of Armada analyzing various high level sets. How to make shield drop notches using tape instead of filing your controller shell. How to cut your shoulder button springs to make them easier to press. An amazing compilation of frame data gathered without using any kind of special tools or AR. It mainly focuses on ranking each character’s options such as frames of jump squat, roll distance, shield size, jump height, etc. Explains DI (Directional Influence), SDI (Smash DI), ASDI (automatic SDI), and more. A technical thread that explains what trajectory DI actually is and how it works. An album of images that show what analog stick inputs will do what in different action states. Gravy explains how to control the aerial drift out of a jump in what he calls an analog jump. A program for reading character files. Allows you to look up data directly from the game files on each character, their moves, and their animations. Excel spreadsheet that can be used to calculate the effect of hitting people with moves. Useful in conjunction with MasterHand. List of every character’s common out of shield options and how many frames each option takes. Used well with StrongBad’s shieldstun calculator. About all the possible angles one can get with the analog stick. A collection of data about how fast characters can move on the ground. Also includes the size of stages. Fly Amanita discusses how inattentiveness to frame refreshing can cause one to mess up despite correctly timing a stream of inputs. It is a bit of minutiae, but knowing may make a difference. 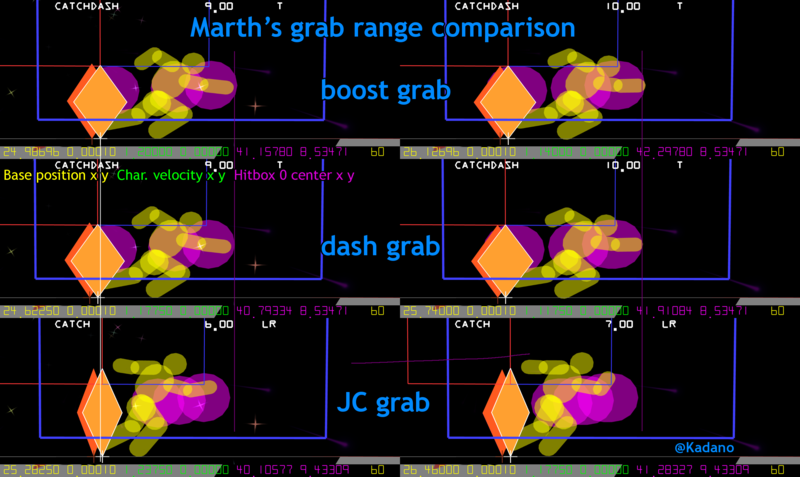 Some technical details about boost grabs. 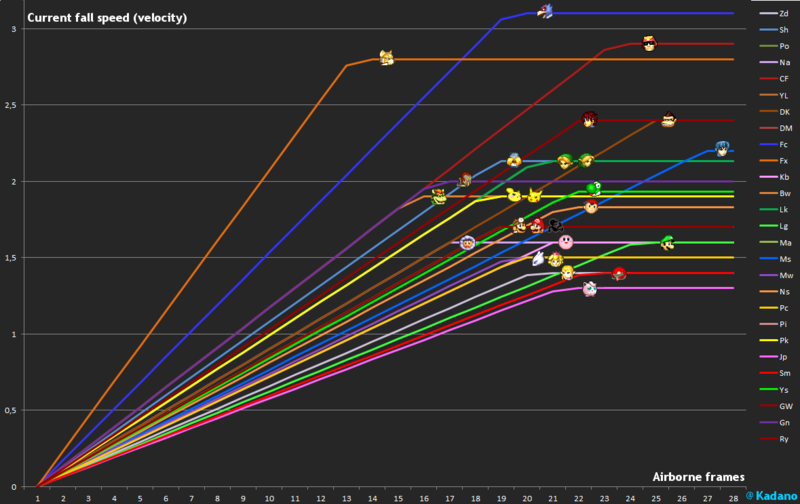 Graph illustrating characters' gravities and max fall speeds. Various frame gurus answer questions. Lots of great posts by StrongBad, Kadano, Schmooblidon, Magus, and more. Great for searching. Questions about lots of things get answered. Lots of Magus posts. Great for searching. A guide on how to DSDI tech by Witchking and with help from Magus I believe. This technique is also sometimes called Amsah teching. A list of stun data for most characters’ moves. Though, there is nothing you can cannot calculate with just Kadano’s augmented spreadsheet of move data found on his thread. Similar to Schmooblidon’s Ground Movement Analysis, but this has explanation and discusses application a bit. A guide for calculating frame advantage on shield. Your ECB is different depending on how you grabbed the ledge. Schmooblidon breaks down how one can manipulate environmental collision boxes (ECBs) to land quickly on platforms. He explains no impact lands, aerial interrupts, platform cancels, and platform warps. Additionly, here is a list of every move that can be platform canceled. A website with awesome interactive heat maps of character hitboxes, informational gifs and videos, a visual knockback calculator, and more. Kadano explains why back dashing is made harder due to the way the game is programmed. Lots of info about the mechanics of the invisible ceiling glitch. Peach, Marth, and Roy can also activate the invisible ceiling glitch with their counters. A spreadsheet outlining the maximum possible advantage for each character’s aerials. Nothing that cannot be calculated with StrongBad’s knockback calculator spreadsheet. A bunch of old frame data collected by SuperDoodleMan. This explains what happens when you’re hit by a move but already in knockback from another move. Use this to test at what percents certain moves will break crouch cancel and ASDI down. A tool that calculates trajectories and hitstun. It is useful for seeing how various factors affect knockback, and can be used to calculate kill percents. Schmooblidon also made tutorials, 1 and 2, for using it. A video explaining Magus's writeup on the topic. Knockback does not quite scale linearly with charge frames. Code for changing hitbox display to remove graphic effects that obscure hitboxes. Reflected projectiles take the stale move queue of the opponent's equivalent move. Typo explains the mechanisms behind controllers with good dashbacks, how to test whether your controller has good dashbacks, and the benefits and consequences of having good dashbacks. Post explaining potentiometers, and snapback and dashback issues. He also explains the capacitor fix for snapback. Random ECB distortion when hit in certain scenarios can help you wall tech on recovery. This code modifies the hitbox visualization to display extra useful visualizations. How to mod your controller with a capacitor to prevent snapback. A specific Ness hitbox that connects with another player will not connect with that player again until it has connected with at least 12 other things first. A series of in-depth, technical explanation of various Melee mechanics. He introduces technical terms to be able to talk about other technical things. He explains teching and how to perform an “Amsah” tech, and multiple SDI. This thread is a goldmine of information. Not only is it technical analysis, but it also applies that analysis to actually playing the game. There is lots of good information in there for every character main. A lot of it is about Marth. Some other general info includes turn animation info on smash turns and tilt turns, rebound and clanking, grab breaks, shield drops, light powershield, control stick input maps, grounded actionable ledge intangibility, environmental collision box explanation, shield SDI, Z-powershield, shy guy DI, Fountain of Dreams platform heights, a hitbox spreadsheet, and much, much more. I made this section because I had a lot of links for Marth and Peach. As I have stumbled across links for other characters, I have developed their sections. If a character is not included, it is because I would only be linking the stickied threads on Smashboards. Check out Smashboards’ character discussions to start research if you do not see your character here. If you have any suggestioned links, I would love to hear them. This video explains basic Bowser techniques such as his Up-B OOS. The introduction also has and interesting discussion on Bowser's weaknesses. The post is a joke but there is a link to a Google Doc in the post that is the actual guide. Are You a Captain Falcon Player? They give an overview of Captain Falcon the character to give you an idea of whether you would like to play him. This is actually a (somewhat) old collection of different posts by various Falcon mains on multiple match-ups. Gravy explains in technical details Falcon's movement options. Gravy discusses four different types of techchasing with Falcon. Lots of questions and answers about Falcon. May give you a place to start. Use the search function. Has info on stage picks, matchups, training regimen, and FAQs. Playlist. Learn what the Florida Falcons think about how other people play Captain Falcon. The 20GX crew discusses basic movement options, frame advantage and invincibility options. Gravy and Gahtzu explain utilizing analog jump and aerial drift with Falcon, as well as tech chasing. 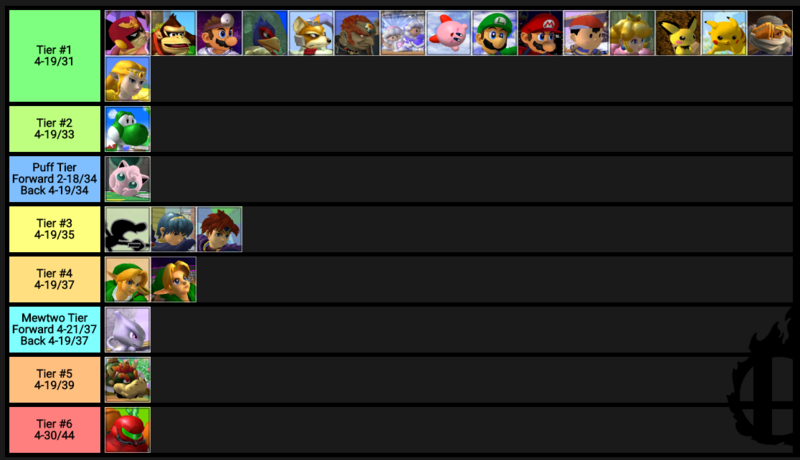 Percents to help followups on Sheik. The fastest way for Captain Falcon to grab the ledge in many situations. Some Captain Falcon minutiae. Dash attack wall jump, pivot wall jump, sticky walking, quick ways to get to ledge, SH nair data, crouching in run boost run, dsmash on platforms, run b cancel and vududashing, rising falcon punches, and Mango's stomp spacing. Movement is Captain Falcon’s best and most fundamental tool. Optimizing your control of it is important. Achilles explains how the Gentleman technique is programmed into the game to help players perform the technique. A video that covers training your Captain Falcon's combo game, defensive game, and control by yourself. Wizzrobe discusses shield pressure, ledge options, approach options, combos on Marth, combos on Sheik, tech chasing, the Fox match up, stages Captain Falcon likes especially versus Jigglypuff, punishing Jigglypuff, the Falco match up, and random Q&A. A video going over aerial follow-ups on Marth. A thread similar to Kadano’s thread but for Falcon. A tutorial/compilation exemplifying great Falcon edgeguarding tactics. A NTSC-specific technique regarding raptor boost. Trials are technical challenges meant to improve your techskill. A playlist of videos showing how to practice Captain Falcon. Tech chasing with double jump dair. Lots of frame data on Doctor Mario (and some of the other Mario Bros). Collection of old information about Doctor Mario. Chaingrab info by Magus, move discussion, Doc in teams, matchups, and edgeguarding. A somewhat old thread containing matchup guides and general tips on playing Doc. Video showing various Doctor Mario techniques. Wacky tricks with Doc's up-b cancel. Collection of nearly every DK video. An old guide talking about the uses of DK's throws. A very simple introductory guide to DK. It covers the uses of his moves and also cargo uthrow combos. Are You a Falco Player? They give an overview of Falco the character to give you an idea of whether you would like to play him. Essential Falco tech inspired by the trials system in Street Fighter. Small guide on a faster way to drop through platforms after lasering. Also includes a good explanation of Shai and Isai drops. An old guide on multishines. The image links are broken. A playlist of a few videos demonstrating Falco techniques including laser, mobililty, combo, and recovery tricks. Lots of great discussion with input by PPMD himself! A video showcasing options Falco can perform intangibly from a ledgedash. A document outlining Squid’s thought processes in solving problems as Falco. Shooting low lasers off the stage to edgeguard spacies’ side-b. A single set of inputs that will yield a double shine grab or a Westballz shine depending on how fast you execute. Mango describes how lasers exert pressure on your opponent and the kinds of mixups they create. How much intangibility you can expect from Falco's ledgedash given certain jump and airdodge timings and ledgegrab setups. A way to perform multishine pressure so that "if the shine is grounded, you get a shinegrab. If it's aerial, you wavedash down, and can resume pressure." They are: not getting much off throws, using side-b to recover too predictably, double laser from the ledge too predictably, spamming spotdodge, shooting the same number of lasers before approaching, not dash dancing, and using dair too much. It is "take the laser, then do an action". Druggedfox discusses fastfall timings to achieve the best possible frame advantage on aerials. Old matchup info. Still some useful stuff. It is old, but maybe you will find some nuggets. An extremely in-depth guide to everything Fox. A video demonstrating and explaining essential Fox tech. Is Samus the Secret to 20XX? An analysis of the Fox vs Samus matchup. It touches on a lot of different fundamental ideas about spacing and option coverage that most players/characters could learn to apply to their game. Changes due to port priority. A playlist of videos showing Lucky’s favorite Fox techniques. Compares the fastest ways for Fox to grab the ledge from far away. Ippo goes over waveshine execution and what it can lead into. Fox can shorten his side-b at different lengths. This is how you do them. A video showcasing Fox’s options he can perform intangibly from a ledgedash. An additional ledge option for Fox on Yoshi's story and Battlefield: no impact land with a laser. A work-in-progress post listing important tech skill to learn as Fox. Most of the items have links explaining the tech. For the rest, you can probably find in the Melee Library. Useful for learning to tech chase. List of techskill to practice and learn as Fox. SFAT discusses his approach to the Fox vs Pikachu matchup, one he is known for doing quite well in. Shine, jump, edge cancel advanced tech. NanchoMan describes a musical method based on rhythm pulses to land the Armada shine. In this video, Remix looks at the multiple ways you can use Fox's blaster and their most effective uses. Some of Fox's hurtboxes extend slightly outside of his shield. You can use that to punish him while he's in full shield like SleepyK does with Falco's shine in this video. This Fox practice routine will ensure your techskill is crisp and efficient. Has the Fox - Jigglypuff matchup been solved??? SFat vs Hungrybox Analysis. Stratocaster explains ways to hit with only the second hit of Fox's uair. Use the ECB distortions of neutral B to quickly board platforms. The angle you approach the ledge with Firefox can make wall teching easier. A specific shield poke on Jigglypuff with Fox's uair. A VERY serious video describing why Ganondorf is actually the best character in Melee. A Q&A thread. Search it and become enlightened. A detailed guide on techchasing as Ganondorf. Includes percents and follow-ups. Ace discusses edgeguarding. Includes sections for a lot of characters. Some old advice on matchups. A glitch with Ganondorf's Up-B in the 1.00 version of the game. Are You an Ice Climbers Player? They give an overview of Ice Climbers the character to give you an idea of whether you would like to play them. Exacron discusses the various methods of de-synching. Includes a section on the Freeze glitch. A 2007 post detailing combos and grab follow-ups (in fear that wobbling would be banned completely). Discusses how to do the infinite properly, how hard is wobbling, the psychology behind wobbling, stuff that leads into grabs, lagless setups, should wobbling be banned? Peef answers questions about Nana's throw and pummel tendencies, how DI affects throw combos, which quick grab combos kill faster, and when Blizzard will freeze the opponent. Frame perfect wobble with blizzard instead of ftilt or dtilt. Ice Climbers can do crazy shield pressure utilizing desyncs. A video showcasing Ice Climbers’ options they can perform intangibly from a ledgedash. A series of videos about Ice Climbers. Includes hand-offs, wobbling, basic desyncs, advanced desyncs, shieldstun desyncs, and probably more since the writing of this. A massive collection of information and quotes from respectable players about Ice Climber strategies. Very precise inputs can make both Ice Climbers perform different attacks at the same time. Old video of useful desyncs. An alternative to regular wobbling. An old video of random little Ice Climbers tricks. A playlist of not only basic Ice Climber tech tutorials but also some obscure stuff that is really interesting. Ice Climber Mechanics: "The Force"
An explanation of the "gravitational pull" of the main Ice Climber on the backup climber. General guide to beating ICs. A long, but immensely in-depth analysis of Ice Climbers prompted by ChuDat's set against HungryBox at Dreamhack Austin 2017. The details of the chaingrab. A blog where Alex shares ideas and knowledge about Jigglypuff. Thread on SmashBoards discussing aggressive play with Jigglypuff. A very important if somewhat underused tech to punish Marth's up-tilt spam. Video of various kill moves being DSDI’d as Jigglypuff to survive. The percents in the video are the limiting cases. Some of these moves are stale when used on Jigglypuff so the percentages may be slightly higher than with a fully un-stale move. A compilation video of every one of Hungrybox’s rests. Study for rest setups. A video showcasing Jigglypuff’s options she can perform intangibly from a ledgedash. Combo options versus Fox at 0%. A technical deconstruction of Puff's Fthrow. A beginner level Jigglypuff guide. Your generic stickied character guide. Try searching the thread, too. Old thread about how to play Jigglypuff. Some info might still be relevant. Grabbing the ledge in tricky ways using Puff's up-b. They cover how to practice using aerials with various jumps, spacing, timing, and drift, practicing combos, and using the ledge. A small hidden hitbox inside Jigglypuff when she does rollout without charging has high knockback. Alexpuffstuff lists Puff's ledge options and steps through their vulnerabilities and weaknesses. 10 different ways to use Jigglypuff's bair. It's a dash-attack canceled grab. Community discussion, involving Saus, on how to make Link as good as he can be. Saus discusses Link's general gameplan against Peach. An extensive discusses of Link's grab follow-ups on multiple characters. Are You A Luigi Player? They give an overview of Luigi the character to give you an idea of whether you would like to play him. Gravy weighs in on 20XX techchasing with Luigi. Here is a Smashboards thread with the same content, but with discussion by real Luigi players. The Official Luigi Matchup Database! An introduction to Luigi for beginners. People keep asking questions about these moves and misfire, so they made a thread with clarifying information. A really old (2006), but in depth, guide about Luigi. Good for beginners. How best to mash to get the most distance from the tornado. Good discussion in the comments too. A series of challenges for Luigi inspired by Street Fighter's trials system. Luigi starts with his down-b charged on certain stages against certain characters. Control your momentum out of wavedashes better using dashes and pivots. A video showing Luigi's ability to haxdash invincibly. Pictures of the coverage of Mario’s edgeguard options. A Q&A. Use the search function. A general guide on Mario. A Rookie answers various questions. He found some applications for the landing hitbox of Mario’s dair. Credit to AirFair for compiling most of these links. Are You a Marth Player? They give an overview of Marth the character to give you an idea of whether you would like to play him. A compilation of smart things said by good Marth players. Includes general Marth tips and theory, as well as matchup notes. Most info is pre-2014. These guides are pretty simple. In his words, “They're mainly aimed at players who struggle with a matchup and need a good starting point.” This also includes a very detailed flowchart to chaingrab Fox to death on FD (this was probably written for PAL Fox, but most of it still applies). Compilation of information from various Marth players. None of it is tested so some info may be inaccurate. It is a place to start. I have found Beat’s chaingrab flowchart above to be pretty effective even in NTSC. A guide on how to play Marth. This guide is unique from the rest in its emphasis on explaining the fundamentals. Even players who do not play Marth could learn a lot from this guide. Tai also discusses each of Marth’s moves and how they are useful, or not. At the end, he gives a few matchup tips. Neighborhood P discusses the Marth vs. Sheik matchup. Kadano applies intensive frame data analysis to optimize Marth play. Most of the information is indexed in the main post, but the second post, below the indexing, also includes more information that is not indexed. Includes gifs of all of Marth’s moves showing hitboxes and hurtboxes. Also lists frame data on each move. Crimson Blur lists 21 things Marth players should practice. A video demonstrating and explaining essential Marth tech. A series of videos demonstrating various techniques and their applications. A video explaining how to pivot with Marth and some applications. Ken talks about how to play Marth. Ken talks some more about how to play Marth. A very old video about how to play Marth. A compilation video of Mew2king edgeguarding with Marth. I suggest putting on your favorite music or Pandora station and watching these attentively. Get a feel for how Mew2king edgeguards. You can also learn a lot using situational analysis by creating flowcharts of the options Mew2king has and the opponent has and then analyzing the options they choose to do in each situation. The Moon talks about movement with Marth and general tips. Gfycat of invincible haxdash with Marth. Use the frame advance options to see inputs and breakdown. Kadano also includes a breakdown in his Perfect Marth Class thread. Some of Marth’s moves sometimes do not come out on Dreamland. It’s dumb. Playlist of videos created by Ippo about things you can practice on your own. Mostly Marth, but there are some other characters in there, too. Sycorax explains how you can angle Marth's Up-B vertically. A useful tool against Fox's Up-B recovery on stage. A simple flowchart that covers most of Fox’s recovery options in most situations. A video showcasing Marth’s options he can perform intangibly from a ledgedash. A little bit of jank for techchasing Sheik. A huge long thread of people talking about Marth. Use the search function to find what you want. Most of the good stuff has been compiled in Mookie Rah’s google doc. A simple flowchart to chaingrabbing Fox and Falco. This flowchart is not perfect but should get you most of the way against most spacie players. Tafokints teaches Marth to Van. You can cancel the first 3 frames of dash into a fsmash and this video explains uses for that. A playlist of videos showing movement options, attack options, ledge options, how to Ken combo, how to chaingrab, and how to use third hit down side-b meteor. A set of flowcharts outlining a robust set of options after uthrowing fastfallers. Tricks to use in the matchup. Most importantly, conditioning drift in order to land safe grabs. The throw combos are better explained in Kadano's thread. The bthrow combos are not real. Combining horizontal and vertical sweetspot. An explanation of what the yo-yo glitch does and the jackets you can attach to Ness using the glitch. A explanation of how to activate the yo-yo glitch. Find frame data in the Ness hitboxes and frame data thread. Are You a Peach Player? They give an overview of Peach the character to give you an idea of whether you would like to play her. MacD introduces you to the essentials of Peach. A beginner’s guide to practicing Peach. A wonderful starting place for anyone learning Peach. Quetzalcoatl adds some more info about how turnips work. Lots of information about floating and how to use it. VaNz discusses Peach’s matchups, giving some dos and don’ts. It is an outdated source, but much of the information and tactics are still good. If not, they provide a good starting point to begin approaching the matchups. Search the thread too for additional information. Shows gifs of all of Peach’s moves displaying hitboxes and hurtboxes. Also lists frame data on each move including frame advantage on shield. Data on various aspects of Peach. Turnip, throws, moves, chaingrabs. An analysis of Peach’s mixup game on shield. Fun tricks when you pull a Bob-omb. Peach has an intangible ledgestall on battlefield. Peach can use her double jump land to act quickly out of a run. Minimally 7 frames. How to squeeze the most out of the RNG aspects of Peach. DoH explains his tactic for fighting Falco: powershield everything! Put on some music and study how Armada edgeguards multiple characters. The table shows, for each throw, the initial X and Y velocity vectors, the magnitude of those vectors added [speed (speed/0.6)], and launch angle. A comment correcting some information in this video. Contains info on the chaingrab on fastfallers, escaping dthrow knee, when nair causes more knockback than fair, turnip interaction with Fox/Falco's up-b, Peach's shield pressure, reaction tech chasing off uthrow, how staleness affects the end of Peach's chaingrabs, escaping Marth's fthrow regrab, uair aerial interrupt combo, sweetspot up-b, dthrow and uthrow followups, dash attack, dash jump nair to end chaingrabs, air to ground turnip throw mechanics, Samus jab shield pressure, glide tossing, move staling, parasol fall rates, up-B out of shield, parasol flick combo, how to escape Fox's uthrow uair, and more. Percent data on causing jab resets with jab, dair, and z-dropped turnips. Peach bomber does a lot of shield damage. For comparison, Marth's shield breaker uncharged does 31.78 shield health damage. Peach smash bomber does 19.88. Max shield health is 60. So this should break shields when the opponent has about 1/3 of their shield left. Stitch face does about 21.5. Mr. Saturn does about 32. A video showing what Sycorax explains in his thread. Throw turnips farther by throwing them backward. Peach's bomber has strange properties that allow it to clang with moves in the air. A directory of Armada Peach combos on fastfallers. Similar to double jump no impact land. Press and hold X/Y early to float instantly after leaving platform. A thread exploring how Armada's shield pressure could be optimized. A niche trick to prevent wobbling. Frozen Turnip Glitch Finally Solved! This explains the mechanics behind the frozen turnip glitch. How to use Peach's side-b against a wall to help recover. Armada advises Peach players to use wavedashing, not be lazy with movement, use shield more/better, mix up and guess better, and be willing to go off-stage for edgeguarding. M2K goes over various aspects of Pichu so you can win some embarrassing money matches. Are You a Pikachu Player? They give an overview of Pikachu the character to give you an idea of whether you would like to play him. A discussion thread. Search and learn. Collection of informative things said by top level Pikachu players. N64 writes about his thoughts on matchups. Lots of old info with a few updates for modern meta. Pikachu’s uair has lots of weird hitboxes. This is how they work. Up to date match up information by the best Pikachu player in the world. At the time of posting this, only Fox and Falco are completed. Pikachu's and Pichu's up-b cancels all knockback momentum on the 14th frame. Axe discusses quick attack sweetspots to the ledge from the stage, moonwalking, and aerial interrupts. Are You a Samus Player? They give an overview of Samus the character to give you an idea of whether you would like to play her. Old school Samus tutorial video. With an accompanying thread. A 2008 guide to Samus with interesting discussions in the posts too. A large collection of various posts about matchups. Samus can do some wonky physics stuff with her down special. A video showcasing Samus’s options she can perform intangibly from a ledgedash. It does not show her options after an aerial interrupt from the ledge which grants more intangibility for her than ledgedash. An old outline by Phanna describing Samus’s ledge game. Index thread of discussions on Samus. Lots of old information but some may still be applicable. Buffer dthrow with cstick to covert off of extender grabs on platforms. An old guide with fundamentals of missile usage. Up-B edge cancels to aid with Sheik's recovery. Are You a Sheik Main? They give an overview of Sheik the character to give you an idea of whether you would like to play her. A compilation video of Mew2king edgeguarding with Sheik. I suggest putting on your favorite music or Pandora station and watching these attentively. Get a feel for how Mew2king edgeguards. You can also learn a lot using situational analysis by creating flowcharts of the options Mew2king has and the opponent has and then analyzing the options they choose to do in each situation. Has lots of stuff in it. It has some matchup guides, character specific frame data, and the thread can probably be searched for answers to questions. He means bad for Marth. It is more of a 200 level course. Includes gifs of all of Sheik's moves showing hitboxes and hurtboxes. Also lists frame data on each move. A series of videos where Tafokints teaches Sheik to Atrioc. “You may know the techniques, but you may not know how to use them.” There is lots of good fundamental or generalizable information in there, too. What area Sheik can cover out of shield and how fast. DruggedFox discusses NTSC grab follow-ups on Peach. A video showcasing Sheik’s options she can perform intangibly from a ledgedash. DruggedFox explains how he does his super sick reaction tech chasing. Essential Sheik tech skill to know. A guide oriented towards mid-level players. Includes interesting training exercises to help break habits and understand Sheik's gameplan better. This technique isn't specific to Sheik, but she makes great use of it. A collection of things smart people said about playing Sheik. SleepyK and Swedish Delight have an extensive top level discussion about the Sheik v. Peach matchup. Use wavedash back to cover ambiguous DIs off dthrow. Leffen describes an important recovery mix-up. Credits to PerhapsMan for compiling most of these links. An old (2005) thread. Can be used as a starting guide, but remember that some of the info here might be outdated. An old Yoshi guide with information that is still relevant. There is also a breakdown of game a few essential mechanics. He calls parrying supershielding. Shows gifs of all of Yoshi’s moves displaying hitboxes and hurtboxes. Also lists frame data on each move. A thread of useful Yoshi frame data and other information like combo options. A great thread to search for common questions and answers by the great Yoshi players. Yoshi’s shield is weird and different. Playlist of videos by aMSa demonstrating various weird Yoshi things. Axe explains why Yoshi's grab seems to miss randomly sometimes. Chandy shows various movement tricks to get to the ledge quickly after a bomb pull. Meant to be a social thread for Young Link mains, but still contains interesting information. Use the search function. This guide is rather old but you can still find useful information. NJzFinest describes multiple ways to use your bombs in order to rack up percents and setup kills. This guide is outdated, it still includes old stage picks like Kongo Jungle 64 or Brinstar. You can still browse it to get a general idea of what Young Link mains think about stage counterpicks, but not everything will be accurate. Technical explanation of Young Link's hookshot, as well as various ways to use it effectively. Chandy's massive Young Link project. Read away! Community discussion regarding Young Link's various matchups. "This is a collection of all knowledge that could be be useful in competitive Young Link play." Chandy shows various Zelda tech.